American Vogue’s May 2007 edition featured Sasha Pivovarova alongside other supermodels like Lily Donaldson and Chanel Iman. She was dubbed the next World’s Next Top Model together with her colleagues by the reputable fashion magazine. Now, she is back at the UK’s July 2014 Vogue edition, featuring an ensemble of casual getups for this season. 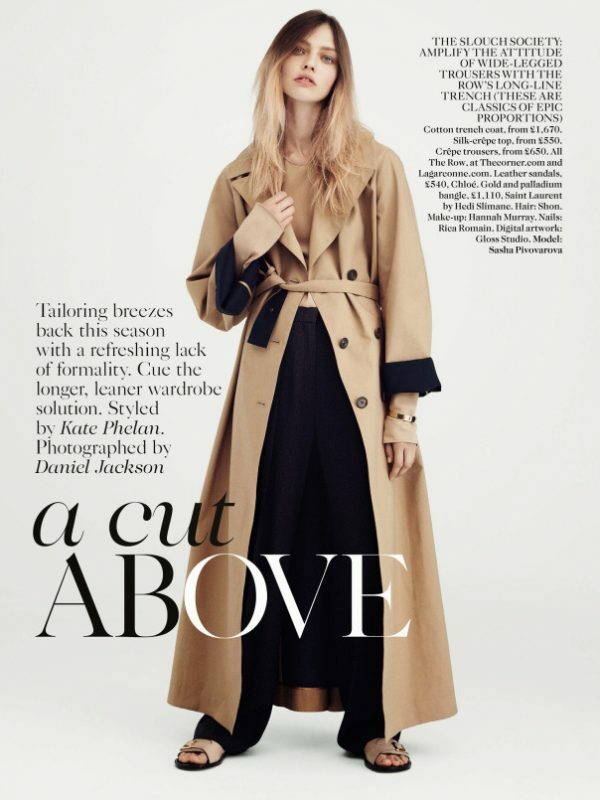 The magazine spreadsheet featuring Sasha Pivovarova displays how good it is to don outfits that are less formal yet still chic to wear and fashionable. The photos are taken by Daniel Jackson and show us the graceful model wearing things from coat to blazer and wool tunic. Perhaps, the most unique of them all is the one photograph depicting Miss Pivovarova wearing an apron-front trouser coupled with a white t-shirt stacked under an asymmetric-sleeve top. The look is surprisingly mannish and one may simply deduce that this ensemble is hard to put on but the result is worth it anyway. The emphasis on monochromatic color scheme helps the look to appear simpler and casual at best. As for the tunic, a photograph of Sasha Pivovarova wearing one would be the perfect example for those troubled with the question of whatever they should wear to work. The Balenciaga-made tunic serves as a great alternative to the more boring regular jackets.